Are you a software developer who aspires to be the founder of the next billion-pound IT startup or a marketer with the grain of a winning idea? Could you pitch an idea related to financial services, build it as part of a team and present the product to a team of judges all within 48 hours? 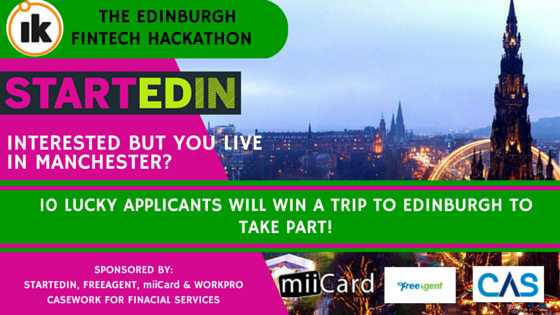 The Fintech Hackathon in Edinburgh later this month will see about 100 software developers, designers and marketers get together to pitch ideas, design software and present the results to a panel of judges. And ten applicants in Manchester could win an all-expenses-paid place on the hackathon, courtesy of Computer Application Services, developer of Workpro casework for financial services. Those taking part in the hackathon will have just 48 hours to show a panel of judges what they can achieve, with more than £10,000 in prizes up for grabs. They will be able to meet potential hirers, use skills they may not get to show off at their current job, spend time with like-minded professionals and perhaps even meet the co-founders for that new billion-pound start up they have been dreaming about. The Fintech Hackathon, which will take place on 21 and 22 November, has been organised by Infinte Kind. Applicants should send a short paragraph by Friday 13 November to info@startedin.com describing why they deserve to win a place at the hackathon, explaining the skills and strengths they could bring to a team.